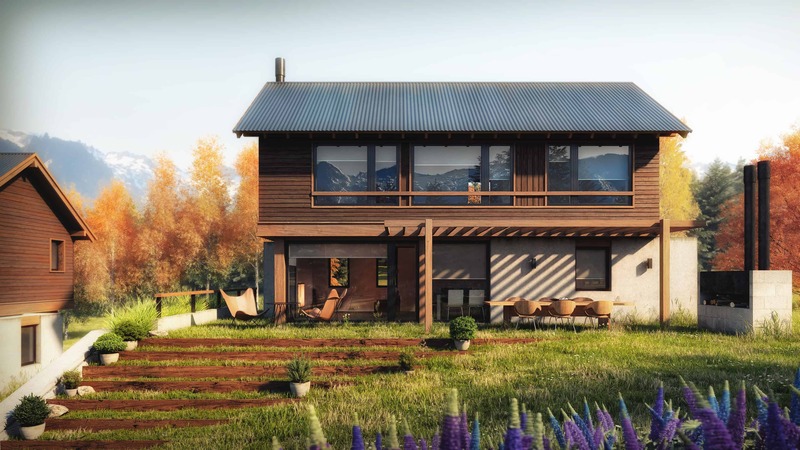 These two houses were designed in a beautiful area at the mountains of Bariloche, located in the south of Argentina. We did the visualization according to the architect’s sketch. From the beginning we were inspired by the vegetation of the area. In winter the vegetation takes a warm color, varying between yellow and orange. There was a connection between the red undergrowth of the area, the tones of the warm populus and oaks in winter, both enhanced by the depth of field generated by the mountainous area. We began from a drawing, provided by the architects. After defining some points of view, new sketches were generated and discussed with the architect. After some corrections we arrived at the final position of the cameras and we managed to define several elements that would complete the composition of the perspective. Then we create the three dimensional model, after that we made some postprocessing to the final Render. We don’t really know! we hope to receive lots of comments to improve our images! The Designer architects, and the owners of the lodges were really happy with the illustrations. We really learn many thing about the species of vegetation of the region, and how they change and adapt to different conditions and seasons of the year. Apart from from that, we think most of people really like warm images. The word imitation originates from the Latin “imitatio” and is associated with the verb to imitate. The latter makes reference to the action of trying to copy another or using it as an example. In this sense, far from the erroneous or degrading concept of imitate, an imitation is a thing or an act which tries to be something, that is generally considered of a greater value. Our role in this imitation is that of representing, with loyalty the requests of our clients, giving it an added value so that their projects can be illustrated with the best result possible and in this way communicate and express their intentions as developers. The work of the photographer is the same as that of the Architect, which consists of making the space habitable, adding emotions and providing the construction with practical, functions and aesthetics. That’s why, when an Architect recognizes his work, saying that the photographer has discovered new perspectives of his work, it is the biggest reward he can receive. Photography of Architecture is an applied art which should follow the eye of the architect, as if looking through their own eyes, always adding something, searching for the exact spacial axis where the work is enhanced, reaching it´s greatest potential expression.